This simple vegetarian recipe for miso soup takes only minutes to make — quick enough for even the most harried of mornings. A big mug full is comforting at breakfast, but you can eat this soup as a snack or part of a meal anytime. Miso is a fermented soy condiment — a rich, salty, savory paste — that’s a key ingredient in many East Asian dishes, including soups, sauces, gravies, and salad dressings. 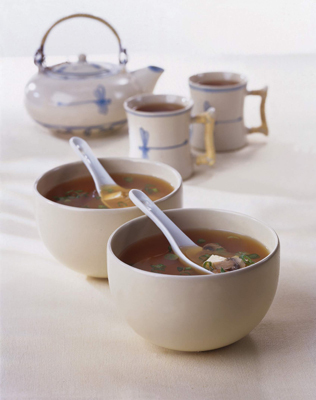 Although you may not think of using miso at breakfast time, it’s a common sight on breakfast tables in Japan, where miso soup is the traditional way to start the day. Pour the vegetable broth and 1 cup of the hot water into a medium saucepan. In a separate bowl, dissolve the miso in the remaining 1 cup hot water. Mix well, and then add to the contents of the saucepan. Add the ginger root (if desired) and mushrooms and heat until simmering, about 5 minutes. Remove from the heat and stir in the tofu and scallion greens. Serve in a mug or bowl. Per serving: Calories 76 (From Fat 27); Fat 3g (Saturated 0g); Cholesterol 0mg; Sodium 1217mg; Carbohydrate 9g (Dietary Fiber 2g); Protein6g.